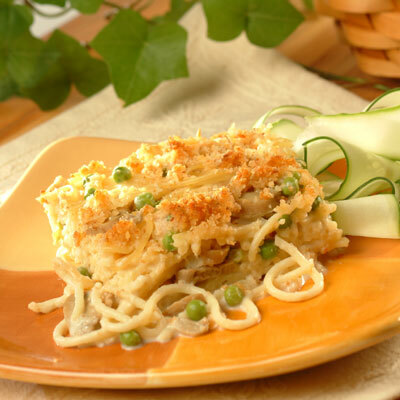 Turkey Tetrazzini is an easy-to-make meal that is tasty and full of flavor. You'll love the crunchy topping. Ready in less than 1 hour. COMBINE bread crumbs and 2 tablespoons butter in small bowl. Stir in 1/4 cup cheese. MELT remaining 1 tablespoon butter in medium saucepan over medium heat. Add onion; cook, stirring occasionally, for 1 to 2 minutes or until tender. Stir in flour, salt and pepper; cook, stirring constantly, for 1 minute. Remove from heat; gradually stir in broth. Return to heat; bring to boil over medium heat, stirring constantly. Stir in evaporated milk and remaining 1/2 cup cheese; cook over low heat until cheese melts. Remove from heat. Stir in turkey, mushrooms, peas and sherry. COMBINE pasta and turkey mixture in large bowl. Pour into prepared baking dish. Sprinkle with bread crumb topping.